The Chinese New Year, or Spring Festival, falls on Tuesday this year. 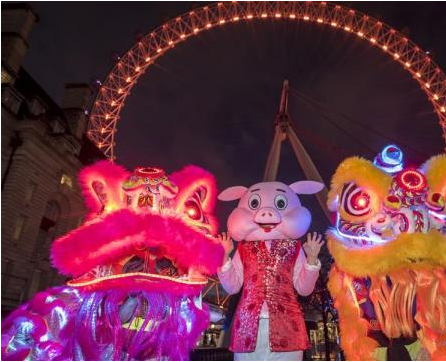 “Many celebrations of Chinese New Year in our French regions illustrate the extent and popularity of Chinese culture in our country,” said Valerie Pecresse, president of the Ile-de-France region. Ile-de-France “is proud to welcome the largest Chinese community in Europe, a hard-working and creative one,” she noted. Meanwhile,French President Emmanuel Macron extended his best wishes “to all those who celebrate the Lunar New Year in our country and in the world.” “Best wishes for this year under the sign of the Pig,” Macron wrote on Twitter Tuesday. “The pig is a friendly animal … that shows consistency… This animal is a good symbol of the energy that must be used today to develop our countries and find the prosperity that I wish to you,” he added. 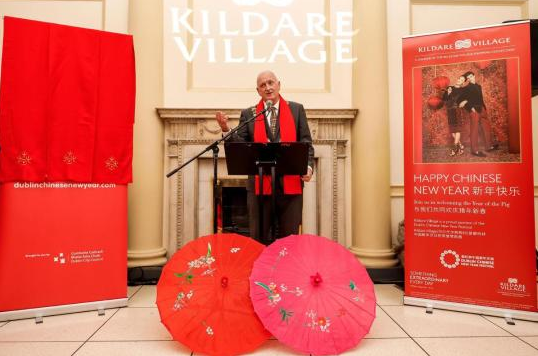 In Dublin’s National Concert Hall Tuesday, a Chinese New Year concert, jointly organized by RTE National Symphony Orchestra and Beijing Performance &Arts Group, feasted the ears of the local audience with a number of masterpieces created by famous Chinese and foreign composers. For 800-strong audience including Irish President Michael D. Higgins, musicians played Ye’s Sichuan Image, a symphony consisting of 30 short etherealized music clips vividly portray the beautiful scenery in China’s southwest Sichuan province, and Starry Sky, Ye’s piano concerto created for the opening ceremony of the 2008 Beijing Olympic Games, among others. “The New Year is important for stores all over Europe, not just in Spain, because Chinese tourists have become excellent clients and it is an honor to celebrate the New Year with our visitors,” said Andrino. The Corte Ingles’ flagship store in the central Paseo de la Castellana in Madrid, welcomes around 150,000 Chinese tourists every year and employs several Chinese speakers to help them make their purchases. “The more attention we can give, then the more comfortable they feel. It helps them feel welcome and that means they spend more time with us. So that benefits us all,” Andrino told Xinhua. “The Chinese are our most important international clients…” said Andrino.